More than a TV station, PhillyCAM is a vibrant community center that connects people and teaches them to become creators, not just consumers, of high-quality independent and non-commercial media. Whether you want to add your voice to a larger community dialogue through media or gain skills, PhillyCAM can help. To renew your membership today, log in to ensure that your renewal is linked to your existing account. Don't have an account? Create one to renew your membership. Click here to watch "how to create an account video" tutorial. In addition to membership, you must attend an Info Session and a Community Media Workshop before you can register for classes or submit a program. Any individual who lives or works in the greater Philadelphia community regardless of race, color, religion, national origin, ability, age, gender expression, sexual orientation, disability or economic status may become a member of PhillyCAM. All members are required to pay an annual membership fee and agree to abide by PhillyCAM’s policies and procedures as outlined in the membership handbook. To support and embrace youth voices we created PhillyCAM’s Youth Program. Our students learn to access, analyze, create and share digital media content with thoughtfulness and social responsibility. Youth Membership is open to youth between ages 14 -21. Membership must be approved by a parent or guardian. VIP access to the annual Cammy Awards Ceremony. Monthly updates via our electronic newsletter. Acknowledgment through PhillyCAM’s website and social media supporter campaigns. Special scheduled guest tours of PhillyCAM’s facilities hosted by our Community Engagement Director. Participation in focus group sessions and community salons. Invitation to participate in a live studio production audience (TV and radio). Supporting members are welcome to participate in our orientation process, but it’s not required. If you are interested in joining as an organization, please make sure this is the right category for you. Organizational memberships are only designated for non-profits, community groups, collectives, and educational institutions. These types of groups may become members by submitting proof of non-profit status or a documented history of working collectively to serve the community. Should you need further assistance clarifying which membership category is best for you, please speak with the Our Community Engagement Director, Nasha Taylor before joining. Designate up to 5 Associate Members to have active memberships and be able to take workshops, receive equipment certification and book the production facilities and meeting space. 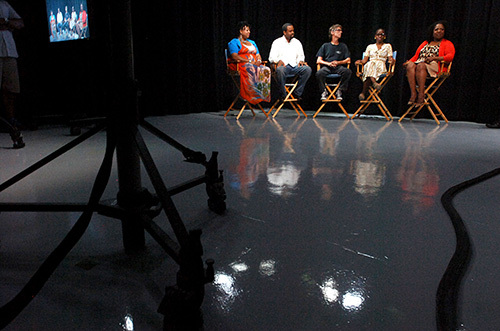 Organize a one-time 30-minute studio shoot to raise awareness about a particular issue or be featured on PhillyCAM’s Go Philly Service program. Hire PhillyCAM and receive discounted production services to document and stream live video from special events, produce and edit short videos for online social media, create in-studio community forums, etc. If you prefer you can join in person. You can pay in person by check, cash, money order, credit or debit card. We can also provide an invoice to non-profit organizations and community groups. Non-profit organizations or community groups may be asked to submit proof of non-profit status or a history of working collectively.